Best Place for Online Equine Classifieds - 7 Tips to Help You Out! Where is the Best Place to Put Your Equine Classifieds? Whatever your equine classifieds, whether your selling tack, trailers or horses – we always want to find the best way to sell our items. Getting the right price, in a good time and to the right home is the perfect combination for any seller. There are a variety of ways to sell equine items nowadays, auctions, table-top sales or online. The online world is possibly the most popular way to advertise equine items. Allowing equestrians to advertise to a larger audience & providing a variety of visual aids to show off their items or horses. But everyone is advertising online! So, how can you get the best out of online equestrian classifieds? TIP 1: Where to Advertise? There are plenty of online equine classified websites for you to choose from. But you need to choose one that’ll work best for you & what you’re selling! 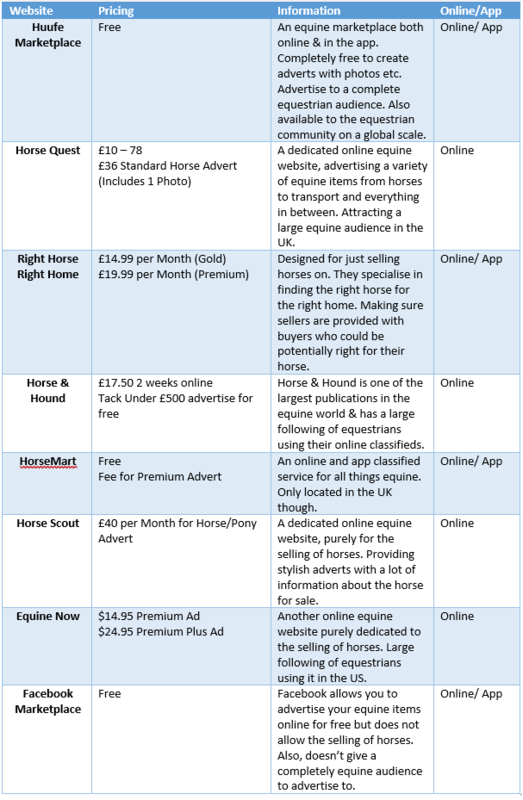 Below is a table of websites / apps that can be used for selling equine items & information about them, to help you decide. Whatever you’re selling, the condition it’s in is a big influence. Condition can affect the price & how well/ quickly it’ll sell. Giving tack or horse wear a good clean before selling it will make it far more appealing to potential buyers. To help buff a few of those scratches out of leather items, rub a dab of olive oil over them. Also using some old nylons to polish tack with, will give it that extra shine. Every little helps! The turnout of a horse will also help when it comes to selling it. Make sure they’re in the best condition they can be, so you can sell them at the best price possible. Not a bad idea to give them a bit of a makeover! Get them clean, make sure their hooves are in good condition, their mane & tail are tidy and trim any excess hair that may make them look a little scruffy. Here are some 10-minute grooming touch ups that can help improve your horse’s look. TIP 3: A Picture says a Thousand Words. It’s true, a picture says a thousand words. Online it’s the first thing we all look at. In the first three seconds we’ll judge whether we like the look of something. So, having the best possible picture will help sell any item. Good Lighting – Make sure your item can be seen clearly. Plain Background – Having lots of other things going on in the background can distract from what you’re trying to sell. Good Quality Image – Make sure the image is of good quality and not too pixelated. Relevant Image – The image must be relevant to the description you write. Looking it’s Best – Make sure the item or horse is positioned in a way that they look they’re best. When selling a horse, you want them stood nicely & looking alert – those ears pointing forward (Easier said than done). Pick up some tips here for taking the perfect picture of your horse. Images are great, but people want more! Videos are pretty common nowadays when selling such things as horses. Allowing potential buyers to see the horse perform from the comfort of their own home. A good video again will aid the selling of a horse. Most of us now have a smart phone in our back pocket with cameras. Allowing us to become our own camera man/ director. Can’t guarantee you’ll become the next Steven Spielberg, but you can certainly produce some good quality videos for selling a horse. You’re selling an item / horse, so show it off! Take a number of photos from different angles, showing off all its features. For horses show them off doing what they’ve been trained to do in a variety of photos & videos. The more the buyer can see of the item, they’re more likely they’ll be interested in it & trust the description. Sellers hate people wasting their time when selling anything. So, don’t waste buyers time & be honest when selling. When writing an advert, you of course want to highlight its best features. But be honest about what you’re selling to inform buyers with relevant information. This way your advert will attract the right person for what you’re selling (again, can’t guarantee this, but it’s the best way to reduce the chances of people wasting your time). Go and browse the online equestrian classifieds. Find an items or horses similar to your own and compare. Compare them to what you’re selling and the price they’re being sold for. This will give you a rough idea. Ask an equine professional for their opinion on the item or horse. They’ll often have a lot more experience of the selling & the equine market. Be honest with yourself. It’s very easy for us to over or even undervalue our personal belongings due to the emotional attachment we have to it. Equine classifieds are a busy place, with plenty of choice. But creating a good quality advert, with well-presented photos & videos and an honest description will make the advert far more attractive to potential buyers. Also choosing where you advertise will help by attracting the right audience making it more efficient.